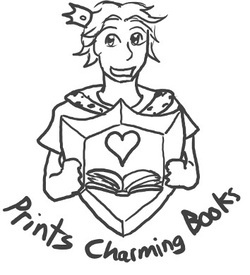 The day Prints Charming was born, a magical prophecy was made. It was drawn up by the court mage, and tucked away in the royal casket for the next eighteen years, at which time the heir to the throne was expected to show signs of a royal talent. That was what was supposed to happen. Unfortunately, a few things went wrong. Well okay, several things went wrong. None of it was my fault. The first problem happened because Queen Charlotte gave birth on the night of the Great Eclipse. Everyone was so distracted by the gathering darkness and the slice of moon gleaming like a vampire’s smile that no one–not even the midwives—noticed the exact moment the queen stopped yelling and the baby started roaring. Thus he might have been born late on the last day of the Year of the Hound (which was a luck-birthday) or early on the first day of the Year of the Camel (which was not). I’ve heard both dates bandied about. Poor Prints must be confused. Some people can’t even pronounce his name. They mix him up with his brother. The prophecy was drawn up by the fort page, Jan Kees. Yes, yes, I thought it seemed odd, but I thought that’s what the king had commanded. The queen was yelling, the eclipse was happening, and a royal terrier was trying to get my best kerchief out the pocket of my apron. You can understand I was a trifle distracted when I took the king’s directions. The prophecy was then to be stowed in the hall basket, and presumably carried off to market the next morning by one of the serving girls. I had close to eighteen years to forget about the prophecy, but as the fateful birthday approached, I started to be mildly anxious. Okay, very anxious. Okay! Anxioused out of my mind. For one thing, there was the problem of which day the prophecy should be presented. Then there was the problem of whether the page had done a good job. And then there was the problem of where the prophecy had ended up. And then there was the problem that someone would probably get around to blaming me. You can see why I considered making a run for it. The reason I didn’t was simple. I didn’t have anywhere to go. Besides, I was attached to Prints Charming. He’s a nice boy. Very artistic. His Majesty assembled the court and made a speech about how proud he was of his heir. Then he said it was a lucky birthday and just as well the heir to the throne had been born in the Year of the Hound and not in the Year of the Camel. After that, he called for the prophecy to be brought forth and read. I cringed. I really should have run, but it was too late now. Besides, Prints was standing next to me, smiling all over his friendly face. I couldn’t let him down. I’d practically raised him. I was talking up a storm to avoid thinking of what was going to happen to me in just a few moments when His Majesty discovered the prophecy wasn’t immediately available. So, I was a bit annoyed when Prints Charming nudged me in the ribs. By the time I’d done that, His Majesty was putting away the royal prophecy. “Has he read it out?” I asked. “Well, duh,” said Prints Charming. “But Charming, I told the fort page, Jan Kees, to draw it up and put it in the hall basket!” I protested.